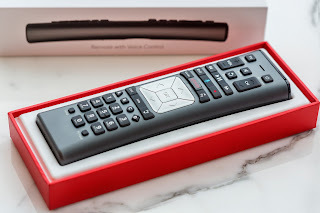 While you wait, you are welcomed to sit in the comfy couches and try out the Xfinity television with voice remote that is set up or explore the Home Security. When you meet with your staff member they take you to an individual podium where they can handle all your needs. In fact each podium has a television set up so you can use the new voice control remote and your customer care representative will be able to show you how to work with the equipment. Can you tell I'm impressed with this new store location? 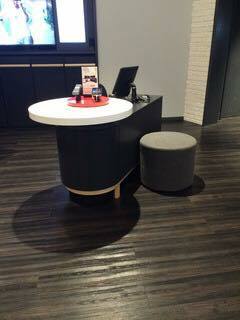 The day we arrived we were met by staff who were eager to show us some of the features Xfinity has to offer. We were treated to a brunch buffet of bagels, danishes and cookies along with a nice little swag bag. They really know how to treat us #XfinityMoms. I was most impressed with the Kid Zone. This is really something I could see making an impact in our television watching. Why? 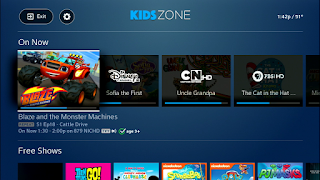 First once you log into the kid zone your child can not log out with out you inputting a code in. This exit code keeps this a safe place where kids can pick their shows from icons and you don't have to worry about them accidentally stumbling upon adult shows. I love this feature! The Kid Zone is included in your subscription free and has easy identifiable pictures for kids to scroll through and choose their favorite shows. You can also break the section down by age groups from preschool to teens. Xfinity Apps allow you to stream right right to your mobile devices. You are able to control your television with a remote on the app. This literally gives you X1 at your finger tips! Xfinity Home Security is 24/7 professional security monitoring. You can access the cameras right from you mobile devices and see who is at your front door even when your away from home. 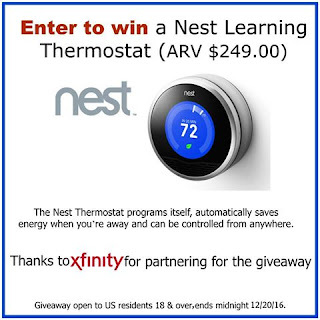 Want to change the temperature of your thermostat? You can do that too! This is more than just home security. It is piece of mind and home management all in one. Other services I learned about was the Sports App. This gives you game stats, times and so much more. A real must have for that sports fanatic in your family. Dad can easily look at the game stats while the little one is watching his cartoons - all on the same television at the same time. Watchable gives you access to the best of the web. This partnership brings viral videos, celebrity gossip and much more digital content right to your fingertips. My favorite new feature is the ability to watch Netflix right through Xfinity. This streamlines your Netflix experience. You do need to still have an account with Netflix and if you don't have one you can sign up for it through Comcast. By streamlining this service to your cable it will run smoother and because you are not going through wifi. I hope this brief overview of the new services included with your Xfinity account show you how much value you are getting for the cost. The voice remote is pretty awesome. Being able to just ask your television to find a show seems like something futuristic. It is so easy to use that even my 6 year old uses that feature.